Comrades, the purpose of my report is purely practical – to issue a warning, first of all to certain people beyond the borders of the allied and fraternal Soviet republics, and then, and principally, to the working masses within the borders of our republic. Today we do not have even that limited certainty about April that in February we had about March. If the fall of Bonomi postponed the conference for a month, for what length of time would an international gathering be put off, if, for example, something similar were to happen in Great Britain? After all, it cannot be said that the laws of nature render this an impossibility! This struggle against the Genoa Conference, which has been converted into a struggle to postpone the Conference, has been accompanied by preparatory politico-military activity in a number of states, notably in those which lie to the West of us. When the French stock-exchange (or, more precisely, the more extreme wing of France’s financial stock-exchange) said that it would in no case enter into negotiations with the republic of soviets, we realised that this meant they were trying to put the price up by five, six or ten per cent. It was not difficult to see through this procedure of a stock-exchange speculator or a merchant, translated into the language of diplomacy: it was obvious to any serious, practical and sober person (and we revolutionaries are sober persons). It was different, though, for the petty-bourgeois elements, and in such states it is petty-bourgeois who are in power, sometimes two-bit politicians with little experience and a narrow horizon: it is easy for serious, hardened stock-exchange speculators and imperialist diplomats to take them in. And so, when we read this barrage against the Soviet Republic, we are sure that it is not meant for us, or is only in the last instance meant for us, because we think that in London, or even in Paris, where policy is conducted by less pretentious persons, they realise that we understand the system. Between ourselves, on the one hand, and Paris and London, on the other, lie a series of new, inexperienced states – and it is there that these political, diplomatic and financial shells, fired by the radio, find their mark. It is there that they burst, there that they disseminate asphyxiating gases, there that they stupefy the brains of the ruling groups: together with the latter, the Russian White-Guard émigrés interpreted the postponement of the conference as a direct summons, a direct order once more to try their luck at the game, once more to try to smash the Soviet republic. We remember, comrades, one such experience we had, on a small scale. It was at the beginning of 1919. That same British Government assumed the initiative of calling for an international conference with participation by Russia – or, rather, with participation by those several ‘Russias’ which existed at that time. Many of you will remember that affair of the Princes’ Islands, when every government established within the frontiers of the former Russian Empire, and having under its feet some bit of territory, was invited to come to the Princes’ Islands to work out an agreement for the purpose of saving Russia. In order to refresh my memory of this episode – the conference was arranged for February 15, 1919 – I asked the People’s Commissariat for Foreign Affairs to supply me with the relevant documents. They sent me, among other things, a declaration by ‘Russia’s Minister of Foreign Affairs’ (in those days there was, besides People’s Commissar for Foreign Affairs Chicherin’ also a ‘Minister of Foreign Affairs’, Sazonov) which stated the following: ‘In view of our non-recognition, etc., etc., I have the honour to declare that neither the Yekaterinodar Government nor the Omsk Government will take part in any conferences to which the Bolsheviks are invited.’ As you see, they spoke very sternly, those Yekaterinodar and Omsk Ministers of Foreign Affairs. At Genoa, of course, things are different – in those days it was the Princes’ Islands, whereas Genoa is situated on a peninsula, and not on an island, so that they are not going to isolate us so completely from the continent of Europe ... In that respect, too, the situation has changed somewhat. Our most extreme enemies write that Petlyura will be there, and Savinkov too, that the Georgian Mensheviks will be invited; but that Sazonov, too, will be invited, they cannot bring themselves even to hint. And, indeed, if the situation at present were such that Mr Sazonov and his like found themselves being invited to a conference where there would be Bolsheviks, they would hardly refuse now as they did then. But, of course, they do not come into it. What happened after that? We replied agreeing to attend. ‘We agree to be present at the same conference with Sazonov,’ Chherin replied. But then what? Having originally been fixed for February 15, the conference was first postponed, then they stopped talking about it, and then, approximately in April and May, Denikin’s general offensive in the South began, together with Kolchak’s offensive from Tobolsk, all of which was subsequently supported by Yudenich in the North-West. The year 1919 was the blackest year for Soviet Russia. Both Yudenich and Denikin had understood that initial invitation, followed by rejection, as a call to launch an offensive against us, as a deliberately premeditated attempt to discredit the Soviet Republic with European public-opinion, to show that, even given good-will, there was nothing to be done with us. That is to say, the invitation created favourable conditions for a new counter-revolutionary raid. In 1919 the White Guards were already putting into circulation a map of Soviet Russia which had been reduced almost to the limits of the old Tsardom of Muscovy and which resembled, in outline… a skull. In 1919 the invitation to the conference was converted into a provocation. It is all the same to us whether this was done consciously or not, but we remember the fact quite clearly. And, today, not only in Finland, which was the first to move and which has already been taught her lesson, but also in the other border states, the story of the Genoa Conference has been the story of fresh preparation for a blow against us. It is in order to say this loudly, and to give warning of it, that this plenum of the Moscow Soviet has been called, and from here the warning must resound throughout our country. Hundreds were killed and wounded there, hundreds fell victims to frostbite and had to be evacuated. And all this because certain ruling classes, certain governments, had proved incapable of the simplest eye-judgment. We once, in this very hall, warned how it would end: we warned that we should sweep out with a barbed-wire broom those who were thrown on to our territory. What was the result? Men killed, frostbitten and wounded, devastation – and that’s all … They put their hopes in the League of Nations, in a conference, but the League of Nations, that is, the combinations of bourgeois diplomacy, come and go, but territorial vicinity, Messrs rulers of Finland, remains! And if Finland is to be a neighbour and collaborator she must learn the lesson of the Karelian adventure. For our part, we cannot and do not wish to let it be repeated. We need no second lesson. You know that the Karelian adventure evoked a protest from the depths of the Finnish people. You know that the Finnish Government responded to this with arrests and condemnations for treason. You know that the Finnish Minister for Home Affairs, whose only guilt was that he was opposed to this adventure, was killed by the extreme activist elements of Finland. And you know, on the other hand, that today intensive negotiations are going on between Finland and Poland for the conclusion of a Polish-Finnish military pact. This pact they will, of course, try to give an outwardly ‘defensive’ form. But defence against whom? Who is attacking, or preparing to attack, Finland? Let us speak out plainly and frankly. We do not consider that the bourgeois government of any country, Finland included, is a government that has the right to any great sympathy from us – no, we wish to see workds’ governments in all countries. So, does the bourgeois government think that we are going to establish a workers’ government in Finland by means of bayonets? Does it think that we are interested in territorial conquests, that we have no work to get on with inside our own country? . But, after all, the fate of the bourgeoisie of Europe and the whole world will not be decided in Helsingfors, or in Reval, or in Riga, or even in Warsaw or Bucharest. It will be decided in Paris, London, Berlin and New York. And when the revolution triumphs – we do not know, of course, when that will be – in the most important foci, in France, Germany, Britain and so on, there will then be no question of Finland, of Estonia, or of Latvia, from the standpoint of the revolution: for nobody supposes that, between proletarian Europe and workers’ and peasants’ Russia, this necklace of bourgeois republics will survive … Only the most miserable, limited, stupid petty-bourgeois can imagine that at a time when, taking into account the fact that in Europe and throughout the world the bourgeoisie are still on their feet, we need to have commercial relations with them, we are going simultaneously to undertake, weapon in hand, ‘the overthrow of the Finnish bourgeoisie’. Only a petty-bourgeois, with his limited political outlook, can entertain such fears. If bands cross over from Finland into our territory, or from ours into Finnish territory (which, of course, will not happen), they will be regarded as regular units. In other words, after the agreement has been signed, any crossing of the frontier by bands will mean, and will be regarded by us, as an open declaration of military operations against us on the part of the Helsingfors Government. Otherwise, relations cannot be regulated. And we hope that we shall succeed in regulating these relations better. This agreement will defend Finland immeasurably better than a military, essentially offensive, pact with Poland, or than the attempt which the Finnish Government is making (as we know) to obtain military aid against us from Romania. We must and we want to say now to the Finnish people, to whom we wish tranquillity, peace and prosperity, that we are interested just as they are, in seeing to it that the Finnish people do not give even one little finger to anyone in Poland and Romania, for reasons which are all too well understood. A military alliance between Finland, Poland and Romania will mean for us that we must fear attack on a longer stretch of frontier: it means that we must keep two or three more divisions on the relevant sections of our Western frontier. That would be burdensome. An extra division is a heavy burden to bear: but we shall cope with the additional burden. Every one of us knows that we cannot have any territorial, patriotic or revolutionary motives for declaring war on any of the states lying to the West of us. But a military alliance between Finland and Poland means danger for Finland, too. For us it increases danger by a certain fraction, by one-tenth, but for Finland the danger will be increased by ten-tenths! … We shall wait to see how events develop, but, in the meantime, we note with entire satisfaction the declaration by the Finnish government that it wants agreement, trade, peaceful relations and security on the frontier. Beyond. Finland’s western border, Scandinavia begins We have treaties with Sweden and Norway which are more than commercial treaties, and neither Sweden nor Norway, on the one hand, nor we, on the other, suffer from that. From Sweden and Norway we import locomotives, herrings and other commodities, paying for them with gold. With attitudes what they are at present, however, only two commodities get through our frontier with Finland, namely, bands and contraband. We should welcome it if the Finnish Government were to adopt not a Polish and French but a Scandinavian orientation. That would be advantageous both to Finland and to us, and would also be beneficial for the development of culture throughout the North-West. Moving farther south, we come to two other countries, Estonia and Latvia… We firmly consider (War Departments cannot, of course, be as optimistic as diplomats) that no danger threatens us from Estonia and Latvia, and that with them our trade and peaceful relations will continue to develop. Although I do not hide from you that, in the opeartions planned for the spring, there is a point which concerns Latvia and Estonia: there is talk of a forthcoming march on Pskov and Gdov. It is to be hoped that the ‘League’ will take the necessary measures to ensure that this section of the counter-revolutionary strategy, aimed at Pskov and Gdov, will also remain on paper, for we cannot have two frontiers – one for regular troops and the other for irregulars. We cannot have several different treaties – one for the legal government, another for the illegal one, and yet another specially for the Polish General Staff! We cannot engage in this sort of diplomatic double book-keeping. We shall have to treat all countries in the same way: and any band which crosses into our territory we shall regard as belonging to the regular army of the given state, for which that state will have to answer fully and completely. Now, in this period of anxious pre-Genoa feelings, the question of Warsaw’s policy towards us arises again, in its full magnitude. One British bourgeois paper, the Westminster Gazette, puts the following question to the Polish Government: is it true that Poland has allowed Petlyura’s so-called government to remain on Polish territory? The Polish Government, the newspaper recalls, signed an agreement obliging it to expel these citizens. Then the paper puts this question: from whom does Petlyura receive subsidies amounting to 30 million marks per month? Incidentally, comrades, this is not such a colossal sum: these are Polish marks ... ‘The Polish Government ought to give an exhaustive reply to these questions’ put to it by a serious British bourgeois newspaper. We do not assume to guess how the Polish Government will reply: we do not know whether it will even reply at all. But our government has at its disposal fresh information which is instructive for Russia. In the first place, we know that, in succession to Savinkov , there have come others, Petlyura and Tyutyunik, who are urgently desirous of getting into the Ukraine. At the present time Petlyura is living in Warsaw and his address is known to Mr Skirmunt, the Polish Minister of Foreign Affairs, who also lives in Warsaw ... Of course, Petlyura and his associates will now change their addresses, because this ‘government’ is highly portable: all their belongings go into one suitcase, and it is very easy, in the event of danger, for them to move to another street. We know that the Petlyurists, headed by Petlyura, Vovno, Bezruchka, Danilchuk and the rest, hold their ‘military conferences’ in the Hotel Polski, and carry on negotiations with the Wrangelites (represented by General Makhrov) for an agreement on joint operations: such negotiations are also being carried on with representatives of the Transcaucasian Governments which have now been overthrown. Furthermore, Balakhovich, that highwayman general, is petitioning for 10,000 men to be given him for ... timber-felling and hay-mowing in the spring. To this we can add that they have already engaged in procuring this ‘timber and hay’ – in the eastern regions of Poland there are already bands equipped for timber-felling and hay-mowing: they are armed with rifles and exercised in military drill… And we also know that Engineer Putyata, Balakhovich’s right-hand man, has received 37 million marks for this work! So then, that’s how they are getting ready, over there, for field-work’ in the spring! Every Red Army man must know this. On the other hand, we learn that the French General Staff (or, perhaps, they have a ‘Second Department’ specially assigned to this task?) is ‘au courant’ with all these enterprises and that additional French forces are being assembled in Upper Silesia  that, in the event of success, they may give help and support to Poland. Tanks will come from there. This is, of course, the dangerous section of our frontier! I said that we seek for ourselves nothing that is on the other side of the Polish frontier, but over there they have not yet given up thinking of ‘the frontiers of 1772’  just as Petlyura has not given up the idea of the Ukraine, and of a Polish protectorate over it. The very air that blows across the Polish frontier is infected with chauvinism. It is Poland’s misfortune that the clique which rules there de facto is in a state of nationalistic delirium and is completely incapable of reckoning with surrounding reality. We, however, are sober people. When we want to evaluate some political situation, we first take the temperature, and if the thermometer shows a temperature higher than 37 degrees, we say that, first of all, it is necessary to take some quinine, and only after that to proceed to take some action or other. From protracted observation of the Polish Government we have formed the quite definite impression that Poland is ruled politically by persons whose temperature is constantly at the level of 39 or 40 degrees. That is a very great menace to Poland, because if they should risk attempting experiences such as we had in Karelia, these, we dare to assure them, will prove to be extremely grave experiences. There is a new government in Poland now, and we wish, more than anything else, that it will be sober enough to rule the country wisely, and that its political activity will be carried out at a temperature no higher than 37 degrees. We can then be sure that there will be no complications on our Polish frontier. Still less reassuring is the character of our relations with Romania. I have here a report given at a session of the ‘Supreme Monarchist Council’. Such a ‘council’ exists among our émigrés. The report is, of course, ‘top secret’ (and so we have received it, from various quarters, in at least ten copies) ... It should be mentioned, incidentally, that this is a common occurrence: when ten members of the ‘Supreme Monarchist Council’ or some other such ‘Council’ meet, each of them directs his treachery to two addresses ... This is what we have here. On January 16, in No.690/VP, they report: ‘Information has been received from Romania that another revolt in the Ukraine is planned to coincide with the opening of the Genoa Conference.’ The Ukrainian formations have received orders to be ready for action. Skoropadsky’s formations will take part in this action. The main blow is expected to be struck from Bendery. Since the beginning of January small groups of Ukrainian units have been continuously arriving here. Artillery has also been observed – about 30 cannon and several machine-guns. Talks are going on between the French mission, General Popovich and the Ukrainian representatives about the choice of a commander-in-chief for the expeditionary forces. This question is proving hard to decide: the French insist on the appointment of General Grekov. Many Ukrainian units have said they are opposed to Grekov, on the grounds that he is a Russophil. There is an appreciable intensification in dealings with the Ukrainian organisations in Poland. Delvig is going to Warsaw and Tarnow , to co-ordinate operations ... Since January 1, the Ukrainian officers have been receiving the same pay as the Romanians. The French military mission has presented them with an armoured car, named ‘Marasheshi’. This harmless name, comrades, is hard for us to pronounce – and if we manage to capture the armoured car, we shall give it a new name. On the other hand, the Romanian Social-Democratic papers openly report the following facts: a commission of the ‘Ukrainian People’s Republic’ is now at work in Romania, headed by Matsiyevich, its military section having close contact with the Romanian army authorities; Romania’s arsenal has given the Petlyurists guns, machine-guns and rifles; the Romanian frontier-guards have been ordered to facilitate crossings of the Bessarabian border by the Petlyurists – that is, by bands. As to how this is done, I have some news: it is reported from the Tiraspol area that on March 8 our posts in the area of Tarnovo (west of Tiraspol) were fired on from the Romanian side. The Red Army asks you not to forget that now, too, it is carrying out frontier-defence activity on the Dniester. On the left bank of the river, Red Army men pace up and down, on guard against our enemies, while from the right bank they fire on us, in single shots or volleys; and from time to time a sentry of ours is struck down by the Dniester, reminding us that our problems with Romania are still far from having been solved and settled, and that we cannot go on living under such conditions. We are unwilling that the Dniester shall continue to serve as an artery for bands: and if the gentlemen who rule Romania think that the Genoa Conference is going to sanction such relations, then they are mistaken. Something special needs to be said about Romania’s rulers. We know them pretty well: they have left their full profile, their entire past, in our hands. Unfortunately, we have been too busy (as the French say, we have had other naughty cats to beat) ; and have not found the time, up to now, to make use of the very rich Romanian archives which were evacuated and are now in our keeping here on Soviet territory. The most outstanding among Romania’s ministers, generals and politicians are represented in these archives, in detailed biographies. And the biography of a Romanian minister is not the sort of moral book to be recommended for the education of the young generation ... We hope that our Department of Foreign Affairs will take the necessary steps to ensure that what is most valuable is extracted from the Romanian archives, for the benefit of the Genoa Conference. While this book should not be put into the hands of youngsters of 16 or 16, it would be extremely useful to give it to Lloyd George and Poincaré. There are facts tending to show, comrades, that it is in Transcaucasia that the most acute danger threatens. That is understandable. Up to now we have been wholly concerned with the national pretensions and chauvinist dreams of small states, but in Caucasia there is oil. Oil is a highly serious matter, and the most powerful and responsible stock-exchanges of Europe and America are not afraid to soil their hands with the oil of Baku and the Caucasus. That is why, simultaneously with the reconstruction of the bands in the border states, a union of the former democratic and bourgeois governments of Caucasia is being formed in Paris, under the leadership of our old acquaintance Noulens. And so Noulens, the chairman of the Republican-Socialist party, is acting as organiser of the former governments of Caucasia – the Moslem Musavatists, the Armenian Dashnaks and the Georgian Mensheviks. At the same time, Wrangel is registering his demobilised officers in Yugoslavia and Bulgaria, and their newspapers abroad, and our own sources of information as well, speak of preparations for landings at Odessa, Novorossiisk, Batum and Sochi. Another report to this same Supreme Monarchist Council, if I am not mistaken, says that the offensive to be launched into Byelorussia and the Ukraine in the coming spring will be merely a demonstration: ‘the most serious operation is to begin in Caucasia, where it is proposed that Nikolai Nikolayevich Romanov  is to be commander-in-chief.’ All available forces are to be thrown into the areas of Sochi and Batum. They intend to launch an offensive from Caucasia either towards the Volga or towards the Donets Basin, depending on circumstances. There are rumours that Nikolai Nikolayevich has made contact with the American capitalists and so on. Comrades, we do not propose to overestimate the significance of these preparations, for we know how limited those people’s forces are – their strength does not match their desire. But we should be making a mistake if we were to fail to pay adequate attention to them. The plan is perfectly clear. It follows from certain arguments to be found in the French papers: the negotiations are with Russia, but Caucasia is not Russia – we once recognised Caucasia, a bourgeois Caucasia is the best guarantee, Caucasia means oil. That is what they are saying. In order to make a road for them that leads to oil, the Moslem Musavatists  and the Georgian Mensheviks, the Grand Duke Nikolai Nikolayevich and Tsereteli, are all as good as each other. The stock-exchange is profoundly realistic and does not rely solely upon the White-Guard organisations based in Poland and Romania. The stock-exchange thinks that, for the negotiations at Genoa, it would be more useful if, at the same time, we were to be struck blows on our Western frontier which would weaken us – after all, that will mean that it will receive bigger dividends and, as its greatest hope, it counts on getting Transcaucasia, for Transcaucasia means oil! When we read the French governmental and semi-governmental press, it seems sometimes that these people lack elementary common sense. Actually, this is not so – they do write, certainly, like persons who lack common sense, but they themselves know very well what they want … It is part of France’s plan, they write, that the Soviet Government shall appear at Genoa in the same role as the Germans at Versailles: in other words, they want provisions to be drawn up, at this conference between representatives of the Soviets and representatives of the Great Powers, which shall be presented to the Soviets in the form of an ultimatum. In broad outline, these provisions are to be as follows: dissolution of the Third International; restitution of the Allied Powers’ property, factories and capital in Russia; most-favoured-nation treatment for France; and so on. They will invite us to Genoa, prepare an ultimatum, and present it to us. But what if we should refuse to accept it? If that is how things are, Poland and Romania should settle the question for themselves in a simpler way, independently of the Genoa Conference – because Genoa will bring them no additional material benefits, nor will it deprive us of any. For it is precisely the other way round: if they were to try to present us with an ultimatum aimed at weakening and enslaving us, the result would not, of course, be any numerical increase in our Red Army, but it would weld it into still further unity, and the sympathy with us felt by the worker masses would inevitably increase throughout Europe and the whole world. In Prague, the capital of the young Czechoslovakian Republic, a conference of industrialists was held on March 6, with participation by the government. There they formulated demands to be put to us (Mr Beneš must, presumably, know about them): (1) recognition in principle of the old debts, (2) restoration of private property and private enterprise, (3) compensation for losses by foreigners (4) assignment to each state of a particular territory for its activity, (6) the right to open branches of foreign banks in Russia, (6) full introduction of criminal, commercial and civil legal procedures, and so on. This information comes, it would appear, from a completely reliable source. Yet one does not want to believe that Czechoslovak industrialists have been led astray by such nonsense… If they, or the industrialists of other countries, hope for anything like that, then, of course, the Genoa conference, to which we are going in full willingness to bring about serious economic relations, will prove a grave disappointment for them. In actual fact, what does all this amount to? To replacing the Soviet form of property by the capitalist form, replacing Soviet law by capitalist law. They want to make us ‘snow-white’, and then, they promise, they will love us ... We do not claim that they should love us being ‘red’, for that would be stupid, but we do want them to deal with us just as we are – because we have no intention of changing our colour for the sake of the Genoa conference. We have shown that we can and we wish to create the conditions for collaboration with foreign capital. If they will leave us in peace and allow us to live and develop, our Soviet law will not, of course, be identical with bourgoise law – the capitalists will have to adjust themselves to that, to study and understand it – but within the limits of Soviet law and Soviet legality, a capitalist will be able to carry out very extensive economic operations to his advantage. And, of course, the working class of Russia did not fight for decades under the banner of the proletarian revolution, and carry through that revolution, so as, under the threat of an ultimatum from Czechoslovak or other industrialists, to exchange the right to build a socialist republic for some bourgeois laws, which are quite well enough known to us. The telegraph has brought us the news today that the British Government has taken the decision not to give aid to our famine victims. This telegram is, apparently, in strict accord with reality. It is not that Lloyd George seriously counted on the fall of the Soviet power, but this decision is highly symptomatic. It means that pre-Genoa waverings have again broken out in bourgeois circles, it means that Lloyd George, whose position has become a little less stable, has, in order to insure himself with that section of the bourgeois public opinion which is against any agreement with us, thrown a bone to those diehard capitalists in the form of a decision which is, in itself, of course, quite ‘legitimate’: one cannot force the British Government to help the Volga famine victims. On the other hand, however, this decision, when taken together with the commentaries in certain semi-official British newspapers, acquires a semi-demonstrative character. One of these papers, the Daily Chronicle, says that the British Government’s refusal of aid is due to the fact that the Soviet power still maintains the Red Army … Does the British Government intend to propose, at Genoa, disarmament, or a reduction in the size of armies? So far as we are concerned, there is no reason to suppose, of course, that we shall place any obstacles in the way of any such measures, which would lighten the burden of armaments borne by the peoples ... At the same time as preparations proceed all along the line for new blows to be struck at us in the spring, at the same time as the French general staff is presenting to the Petlyurists such a ‘harmless’ gift as a tank [sic], the British Government, if we are to believe the Daily Chronicle is amazed that we retain the Red Army! Yes, we retain it, for one thing, because we remember very well (as I began by saying) the experience of the conference that was to be held on the Princes’ Islands: after that conference which did not come off, we experienced our darkest and most difficult year. But in those days we were incomparably weaker, in the military sense, than we are now. I much regret that Comrade Rudnev did not mention here something he told me in his personal report. During the Karelian campaign phenomena were observed in the sphere of supply, in the sphere of procedure, such as had never occurred before. (Comrade Rudnev was at the very centre, in the very thick of the operations.) This entire campaign developed with splendid regularity, with that very quality which we were formerly most lacking in. The Red Army men worked like heroes, but that we had seen before. The important thing was that the mechanism itself, the army’s apparatus, had become incomparably more precise, more accurate – and that, comrades, is a very great achievement. We have criticised ourselves frankly and conscientiously enough, and we can, we must, now, take note of the great progress we have made… This army, with its improved apparatus, will be retained so long as danger continues. And every starving peasant in the Volga region knows that we need an army, although he also knows that the army, by the very fact of its existence, diverts to itself resources and foodstuffs. The famine is a very grave physical calamity, which means death for hundreds of thousands, millions of human beings: but if the Russian people were to let them tighten a noose about its neck, that would mean death for the whole people – or slavery, which is worse than death. That is why the starving peasant of the Volga region will accept the existence of the Red Army so long as we have enemies. And we do have enemies. Are they not trying to make the very fact of the famine the starting point for attacks upon us? Why, the decision by the British Government shows the extent to which the famine is, for wide bourgeois circles, not a fact of popular distress, but merely a political fact, an advantage for their diplomats and for the financial aristocracy! We are receiving aid, and not only from the worker masses but also from the bourgeoisie – for example, from such a semi-governmental semi-official organisation as the American Relief Administration. This aid is being developed on an increasingly large scale and is now, of course, playing an immense role in our life. One cannot but value it. I have received information from our plenipotentiary attached to the ARA and other organisations, about the extent of this aid. I think it my duty to publish this information here. In August the ARA undertook to feed one million children. In October it was already feeding 1,200,000, and today it is feeding two million, plus 30,000 hospital patients. At the same time we are to receive from America 20 million dollars, to be used to relieve Russia’s famine-victims. This means that in two or three weeks’ time we shall be able to feed five million adult famine-victims. If you compare the aid contributed by the ARA with that furnished by other, European organisations, you find that all of the latter put together are doing only one-tenth as much. We know that Nansen’s heroic efforts were wrecked on the rock of Europe’s callousness , and we know, too, that the ‘Society of Friends’, the Quakers, are feeding 189,000 children, and so on. These organisations have come here with their staffs, and they are doing very difficult work. Of 170 employees of the ARA, fifteen have gone down with typhus. Two members of the Nansen organisation have died of that disease – the British Dr Farrar and the Italian Guido Pardo. The Swedish Red Cross nurse Karin Lindskog and the German Red Cross worker Dr Gerner have died, as also have two young Quaker girls, named Pattison  and Violet Tillard ... When you think of these sacrifices, you want to say that, in our bloodstained and at the same time heroic epoch, there are people who, regardless of their class position, are guided exclusively by the promptings of humanity and inner nobility. I read a brief obituary of this Anglo-Saxon woman, Violet Tillard; a delicate, frail creature, she worked here, at Buzuluk, under the most frightful conditions, fell at her post, and was buried there ... Probably she was no different from those others who also fell at their posts, serving their fellow human beings ... Here we count six such graves. It may be there will be more, it is even probable that there will be. These graves are a kind of augury of those future, new relations between people which will be based upon solidarity and will not be shadowed by self-seeking. When the Russian people become a little richer they will erect (we are profoundly sure of this) a great monument to these fallen heroes, the forerunners of a better human morality, for which we, too, are fighting. Yes, indeed: without faith that, some day, people will behave to each other like brothers and sisters, what would be the point of fighting, building barricades, fighting battles. We know that philanthropic actions are not accompanied always and everywhere by exclusively disinterested sentiments. But we nevertheless acknowledge that the great republic across the ocean has shown itself ten times more generous, more magnanimous, than the whole of Europe. It has sent us a mass of foodstuff – true, not enough to meet our need, but in absolute terms a very large amount – and it is feeding and saving from starvation many Russian peasants, both men and women, and their children. We often hear and read of the persons who play the leading role in the ARA organisation, and their names are linked precisely with the most hostile actions towards us. We read, for example, in the newspapers, that Wrangel has received a fresh subsidy from influential American circles, and someone has tried to link these ‘circles’ with those circles which are in touch with the ARA. (True, we make a distinction here: not the ARA itself, but only ‘in touch with’ it.) We should like to believe that this is not the case. And it would be deeply interesting to us if the leading circles of the American Republic would clear up this question fully and absolutely. It will be a great day of celebration for us, when, in Washington and New York, it is clearly stated that they have had enough of the Wilson-Kolchak experience, that henceforth they will give no support, material or moral, to the enemies of the Russian workers and peasants. And then the role of the ARA, an immense, magnanimous role, will appear to us in its full grandeur. Then, finally, the attitude of the working masses will be one not merely of gratitude but of ardent, warm feelings. It may be said that, in evaluating the situation in this way, I am identifying the position of the Soviet Government with that of the people. Yes, I do make this identification, and I do it quite deliberately – and so long as they do not understand that, in Washington and New York, they will understand nothing about the history of the Russian people. Our revolution awakened and refined the instinct of the Russian people for matters of state. This people is already absorbing political notions from its surroundings, and drawing conclusions: it senses that the duality which somehow affects our relations with the ARA, in the situation which now prevails, is fraught with danger. While the vacillation concerning the Genoa Conference has raised so many questions for us where our relations with other states are concerned, we must, first and foremost, focus our people’s attention upon what is happening now in Paris, where a quite definite, fully-fashioned manoeuvre is being executed against us. Transcaucasia is threatened with very great danger. Danger exists there under the pseudo-democratic slogans that have been taken up by the interested parties – who, while singing The International, play the role of agitational outrunners for the shaft-horse, the British oil-industrialist. Danger exists, but this must not be exaggerated, for we know the condition our enemies are in. We are familiar with Britain’s domestic situation, we know how its affairs are going in Ireland, we are informed concerning events in India. We know how France is situated, its plans and activities are no secret to us, and we are convinced every day that there is no country which is moving so surely towards catastrophe as France is. We know also what the forces of our enemies consist of. They have formed a united front, beginning in Estonia and Latvia, and have extended it to the Black Sea – and yet another front is to be established in Caucasia. And we warn the working masses and the Red Army of our country, that danger exists. This danger is not so great as it was in 1919, but nevertheless it exists, and we are stronger than we were in 1919. Comrades, if our foes want to test the resilience of our will-power and the strength of our muscles, they will find us the same as we were in October 1917. When we, a defamed, slandered and illegal party, emerged from the underground into which Kerensky had forced us, the entire world rose up against us ... Some regarded us as venal agents, others as murderers, but all were against us ... The situation now is a little differ-ent. Yet there are some, deprived of all common sense, who want to demand that we dissolve the Communist International, no more and no less – that we dissolve the French and German Communist Parties, that we dissolve the vanguard of the whole world! No, we shall not dissolve it. We, comrades, appreciate the situation soberly and realistically: we shall do everything possible to ensure that we have not a single unnecessary enemy. We shall reach agreement with Finland, at any price, we shall come to an understanding with Estonia and Latvia, we shall try to settle things with Poland, with Romania we shall take ourselves in hand once again and find a road to agreement. We lose sight of nothing: we know that these fears with which they try to intimidate us are to a considerable extent a reflection of the dangers which they themselves fear, that Europe is in a difficult situation. And yet, nevertheless, we do not hide it from you that the next few months will be, for us, months of new trials: a difficult spring, the famine, a shrinkage of food resources, wavering in the minds of the bourgeois classes of Europe, a revival of banditry and the White-Guard movement. There may be a revival of internal conspiracies – the creation of a united front against us, ranging from Nikolai Nikolayevich Romanov to Chernov. To that united front we shall, as always, reply with our own united front. We must have no wavering, no vacillation, no intrigues by small groups: no discord must be allowed into our work, there must be no discord among us. In these responsible weeks and months there must be complete unity between the proletarian vanguard and the broad masses of the workers, complete unity of the republic with the millions of peasants, complete unity of the workers and peasants with their armed detachment – the Red Army. 2. Briand resigned as France’s Prime Minister in January 1922, and was succeeded by Poincaré. 3. As a result of a vote of no confidence by the Italian Parliament, the Nonomi Cabinet resigned in mid-February. In connection with this event, the opening of the Genoa Conference was postponed from March 8 to April 10. 4. Probably S.V. Rudnev (1899-1943). 5. The Finnish Minister for Home Affairs, Ritavuori, was murdered in February 1922. 6. The blow struck by the Petlyurists in October-November 1921 was organised with direct help from Poland and Romania. Considerable animation was observed in Peltyura’s circles already in mid-August 1921. The centre of his formations and site of his headquarters was shifted from Poland to Romania. Interned Ukrainian soldiers were concentrated there, and arms, uniforms and equipment despatched thither. All this was done with the open co-operation of Polish officers and the Polish General Staff. Command of the Ukrainian rebel army was given to Tyutyunik, who, at the head of his units, entered Ukrainian territory at the end of October 1921 and raised revolt in Ovruch and Korosten uyezds. The kulak population of Right-bank Ukraine supported this bandit incursion, and Petlyura, coming on November 17 the nucleus of his band was surrounded and almost completely annihilated in the area of Zvizdil, 35 versts south-west of Ovruch. Tyutyunik himself, with a small group of his adherents, took refuge in Poland. 7. Savinkov had been deported from Poland at the end of October 1921; he moved to Prague. 8. French troops had been sent to Upper Silesia in 1921 to police the plebiscite that was held to decide whether this territory should remain German or go to Poland. 9. The reference is to the frontiers which existed in 1772, before the First Partition of Poland, which was carried out by Russia, Austria and Prussia. These frontiers reached, in Russia, almost to Kiev and Smolensk. The demand that Poland be restored within these frontiers was the slogan of the Polish nationalities. 10. Tarnow is about 60 km east of Cracow, on the line running to Lvov. 11. Demyan Byedny, The Soviet Sentry. 12. ‘On a bien d’autres chats âfouetter’ corresponds, more or less, to: ‘We have other fish to fry’. 13. After Grand Duke Nikolai Nikolayevich, perhaps the ablest of the Romanovs, had been (disastrously) removed from his post as Commander-in-Chief of the Russian Army, in 1916, he was given command of the Caucasian front, against the Turks, where he served until 1917. He left Russia in 1919, and was at this time living in France. 14. The Musavatists were the right-wing Social Democratic Moslem (Turco-Tatar) party which was in power in Azerbaijan before the Soviet order was established there. At the time of the Genoa Conference the Musavatists carried on, together with the Georgian Mensheviks, a campaign in the West directed against the Sovietisation of Caucasia. 15. The Norwegian explorer Fridtjof Nansen was the League of Nations Commissioner for repatriation of prisoners-of-war, at the end of World War I. In 1921 he was asked by a conference of Red Cross societies of various countries to lead a campaign for Russian famine relief. His lobbying of European governments to get them to help in this work met with little success, and in August he signed an agreement with the Soviet Government on behalf of a group of voluntary organisations. 16. The text has ‘Pecherson’, but he must mean Mary B. Pattison. See A. Ruth Fry, A Quaker Adventure (1924). 17. 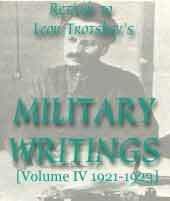 Trotsky’s impression is confirmed by the British journalist Francis McCullagh, who was in Russia for the trial of the Archbishop Cieplak and Monsignor Butkiewicz in 1923: ‘The American Relief Administration has been, for the last two years, doing charitable work on a scale never before attempted in the world, but it is hated (1) by the émigrés, who say that, without it, the Soviet Government would have collapsed owning to inability to deal with the famine; (2) by the Bolsheviks, who say that it is a nest of spies; and (3) by the non-Party Russians, who say that it is a nest of speculators and diamond merchants. The last accusations are untrue; but the fact remains that I have never once heard any Russian, inside or outside Russia, say a good word of the ARA’ (The Bolshevik Persecution of Christianity, 1924, p.304). 18. The All-Russia Extraordinary Commission (the Cheka) was renamed the State Political Administration (GPU) in February 1922.